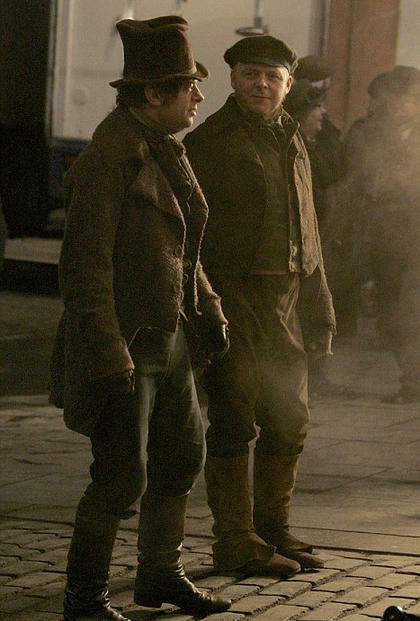 “Burke and Hare” Photos! | Critical End! I’ll be the first to admit that this photo really tell us nothing at all about the upcoming John Landis directed Burke and Hare. Hell, for all we know, it could have been taken while a somewhat fat Simon Pegg and Andy Serkis bar-hopped around London dressed like 19th century Irish murderers. Whatever the case, these pictures prove that Ryan and I did not invent the John Landis comeback story (or Chevy or Pee-wee for that matter), as some rival websites are now claiming…I’m looking at you, Entertainment Tonight Online Experience. See all of the pics over at TotalFilm! Get ready for the Oscars, kids! Oh, and Ryan starts the long road down Alec Baldwin’s “career”! This entry was posted on Friday, February 26th, 2010 at 11:48 amand is filed under . You can follow any responses to this entry through the RSS 2.0 feed. Both comments and pings are currently closed.